"Trump's Muslim ban is real and even more draconian than many anticipated. Visa holders, dual nationals, and even green card holders from Muslim-majority countries may be barred indefinitely from the United States. Based on our analysis of the Executive Order language that is circulating, nationals from Iran, Iraq, Libya, Sudan, Syria and Yemen who are outside of the U.S. with a valid U.S. visa will not be able to enter the United States. The order is written in such a broad manner that it may also prohibit dual nationals of those countries who are citizens of non-targeted countries from entering the U.S. on a visa. Perhaps most alarmingly, it can be interpreted to bar even U.S. permanent residents who are outside of the United States from re-entering. 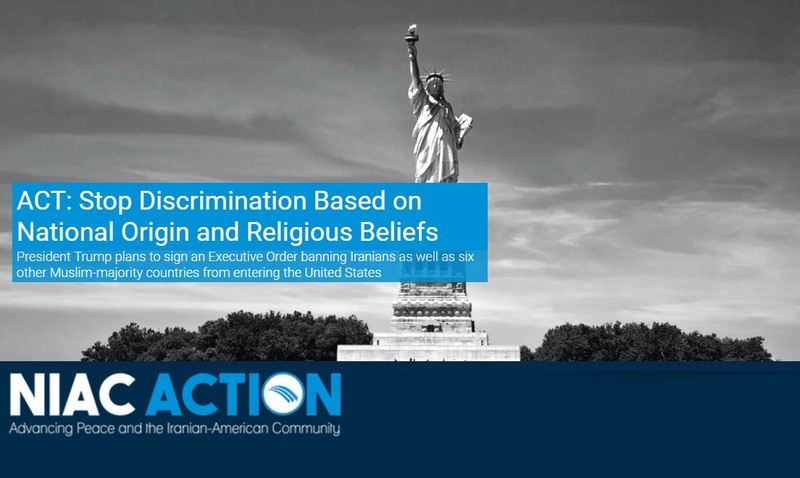 "We in the Iranian-American community are already feeling the effects of this proposed actions. Plans for family to visit, for loved ones to return home, for family friends to join us to study in U.S. schools, are now in jeopardy. There is a palpable feeling of being torn apart from our friends and loved ones. Just a year ago, we were full of hope that the American people and the Iranian people were heading down a new road of engagement thanks to the nuclear deal. Now we are not even sure if parents will be able to attend weddings in the U.S. or if we need to put travel plans abroad on hold for fear of being blocked from coming back. "NIAC Action calls on the Trump Administration to reconsider this dangerous course of action and for lawmakers to publicly oppose this plan before Trump's finalization of the order, which is expected tomorrow. Further, any nominations to key national security or civil rights-related posts, including Secretary of State nominee Rex Tillerson and Attorney General nominee Jeff Sessions, should be put on hold until these actions can be fully evaluated and nominees address the public's concerns. "The list of countries targeted under the Executive Order is based on a discriminatory visa waiver bill (H.R.158) passed in 2015 shortly after then-candidate Trump called for a Muslim ban. We warned then of a slippery slope and are now on the way to a much darker vision of America than many of us could have imagined. "The ban will initially last for 30 days but it is likely that for some countries it will be permanent. The document says that, after the 30 day suspension of entry, the Department of State and Homeland Security will present a report of countries that do not provide enough information to the U.S. to ensure visa applicants from that country are not a threat. Those countries will be given 60 days to address those issues and comply with U.S. requirements. If they do not, a Presidential proclamation will be issued to ban all entrants from that country. "For Iran, mindful of the tensions between U.S. and Iranian governments we are skeptical that Iran would comply with such requirements or that, if it did comply, the Trump Administration would accept such efforts. This would, in effect, mean a permanent ban on entry for Iranians." Related Article: What does Trump's ban on Iranians and Muslims mean for you?